Or, War before the Time of Cholera. Having emerged, disease-free, from my gauntlet of Christmas-holiday air travel (1700 miles each way, and that was only halfway across the US), I can now appreciate the publication of this new work even more. Charters, Erica. Disease, War, and the Imperial State: The Welfare of the British Armed Forces during the Seven Years’ War. Chicago ; London: University Of Chicago Press, 2014. Abstract: The Seven Years’ War, often called the first global war, spanned North America, the West Indies, Europe, and India. In these locations diseases such as scurvy, smallpox, and yellow fever killed far more than combat did, stretching the resources of European states. In Disease, War, and the Imperial State, Erica Charters demonstrates how disease played a vital role in shaping strategy and campaigning, British state policy, and imperial relations during the Seven Years’ War. Military medicine was a crucial component of the British war effort; it was central to both eighteenth-century scientific innovation and the moral authority of the British state. Looking beyond the traditional focus of the British state as a fiscal war-making machine, Charters uncovers an imperial state conspicuously attending to the welfare of its armed forces, investing in medical research, and responding to local public opinion. Charters shows military medicine to be a credible scientific endeavor that was similarly responsive to local conditions and demands. Disease, War, and the Imperial State is an engaging study of early modern warfare and statecraft, one focused on the endless and laborious task of managing manpower in the face of virulent disease in the field, political opposition at home, and the clamor of public opinion in both Britain and its colonies. I didn’t realize we were allowed to look beyond the fiscal-military state – good to know. With the semester drawing to a close, I’ve gathered all my little slips of paper scattered about the house and am typing up all the various notes, questions and thoughts I’ve had over the past semester. Many of the fragments are quite specific and will eventually appear in some type of publication, but occasionally I have a meta-thought, usually in a generic methodological vein, that would probably sound weird if I wrote it in a publication (usually either too preachy or too tentative, or maybe too simplistic or too obvious), so I might as well put it here, where every post is tentatively simple in its preachy obviousness. English troops are obviously superior to other Europeans (“races” as they might have said in the early modern period), a Truth evidenced with a quote from a foreigner who praised the quality of the English soldiery. A battle not-fought, a missed opportunity for battle, would have been a decisive battle if it had been fought, because one of the enemy admitted that had they been attacked, they would have been defeated entirely. At first blush, these confessions from an opponent (or at least from one beyond your own tribe) seem a convincing piece of evidence. After all, your competitors generally resist giving you credit for anything, so when they do, they must be overwhelmed by the Truthiness of your claim. But at some point I realized that an opponent’s “confession” is a bit more slippery than that. There’s an obvious problem with the second, counterfactual, example above – few people really know what might have happened but didn’t (‘fog of war’ making it that much worse in wartime), so the confession’s evidentiary strength depends entirely on the perspicacity and vantage point of the confessor. So you have the basic questions of “What did this person know, when did he know it, how did he know it, and did he generally form accurate judgments about such matters in such situations?” Pretty basic stuff as far as reconciling various accounts go, though actually answering those questions can be quite challenging. Both examples raise another question, however, about the motivations of the confessor. When I come across such claims I’m left wondering about the context in which the confessor made their admission (there’s probably a name for this logical “fallacy” already). Was it intended as a straightforward factual statement, or was there an ulterior motive behind it? Who was the intended audience, and how did that shape the statement? For example, if some foreigner was bragging about how great English soldiers were, was it because it was a truth universally acknowledged? Or might it have been because the confessor was trying, for example, to butter the English up to provide them with more mercenary troops (who may or may not have been the best troops available – they usually needed all the men they could get)? Was it an attempt to play on English vanity in order to acquire their acquiescence, in other words? Or maybe it was intended as a way to indirectly insult or praise some other group? Dunno without the context. In the case of a Frenchman admitting that their army would have been defeated if it had been attacked, is it possible that he said that for some reason other than to state the unvarnished Truth? Was it possible such an admission was really a critique of a competing French general (e.g. the commander of the said retreating army)? Was there some kind of factional or command dispute that might help explain such a statement, and thereby weaken its utility as a piece of evidence for the other side? Maybe an attempt to curry favor with someone, even someone on the other side? To assess the strength of the evidence, we need to contextualize the “confession” in order to figure out what it actually meant. But we rarely seem to get that contextual information. Further, we really need more than just that one single juicy confession. The problem, in my experience at least, is that such frank admissions are incredibly rare in the sources, and readily brandished by partisans on either side, which makes me wonder whether such a ”frank” view would have even been accepted by other contemporaries, people who were likely in as good a position to know. For example, on a couple of occasions I’ve found “well-established” judgments about specific tactical or operational events (repeated ad nauseum in secondary sources) brought into question by other contemporary eyewitnesses. In a few cases a less-quoted source might actually say “Some uninformed people believe X, but I’m on the scene and it’s actually Y.” That should shake your confidence in the original confession, and in confessions generally if we entertain the notion that this obscure source might just as easily be wrong. I had this same problem in Vauban under Siege, where I couldn’t figure out whom to believe in the debate over which front was best to attack a fortress on. * Seriously, now that we early modernists have dozens of contemporary accounts of the same event to compare, we really need to stop assuming that there was consensus on much of anything. McCluskey, Phil. “Louis XIV, Duke Leopold I and the Neutrality of Lorraine, 1702–1714.” European History Quarterly 45, no. 1 (January 1, 2015): 34–56. During the War of the Spanish Succession, the duke of Lorraine trod a difficult path in his attempts to maintain the independence of his state. While Louis XIV agreed in principle to respect his neutrality, the French nevertheless imposed significant restrictions on the duke’s sovereignty. The Grand Alliance, meanwhile, viewed Leopold’s neutrality with suspicion and refused to assist him unless he publicly declared for the coalition. The dissonance in views regarding the status of Lorraine reflected a long-term clash of sovereignties in the region, between France, Lorraine and the Holy Roman Empire. It also reflected the evolving status of neutrality in international relations, as well as attendant tensions within the European dynastic system: though the duke’s policy of neutrality may have saved Lorraine from potential devastation in the war, it severely impeded his dynasty’s ambitions. His book on Absolute Monarchy on the Frontiers is also worth checking out. Warning to wordpress users: be careful when using key shortcuts in the new Create Post interface. As I just discovered, trying to italicize text with the old key shortcut will inadvertently post the post. Not good. … is now available online. Meets next April in Montgomery, Alabama. Of note for EMEMHians, I counted two medieval panels (I consider them honorary members of EMEMH, but perhaps it should be reversed), a couple of papers on the American Revolution, three panels on the Age of Revolutions with emphasis on the Napoleonic (‘natch), and a couple of panels on publishing military history. Personally, I’ll be teaching and preparing for a research jaunt in the summer, but any attendees are welcome to share their thoughts post-conference. 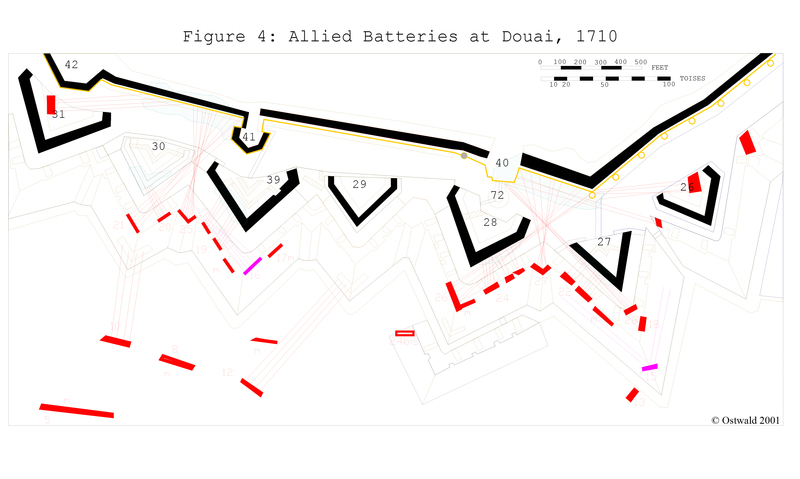 New article in Social Science Computer Review using GIS to analyze the 1714 siege of Barcelona. Rubio-Campillo, Xavier, Francesc Xavier Hernàndez Cardona, and Maria Yubero-Gómez. 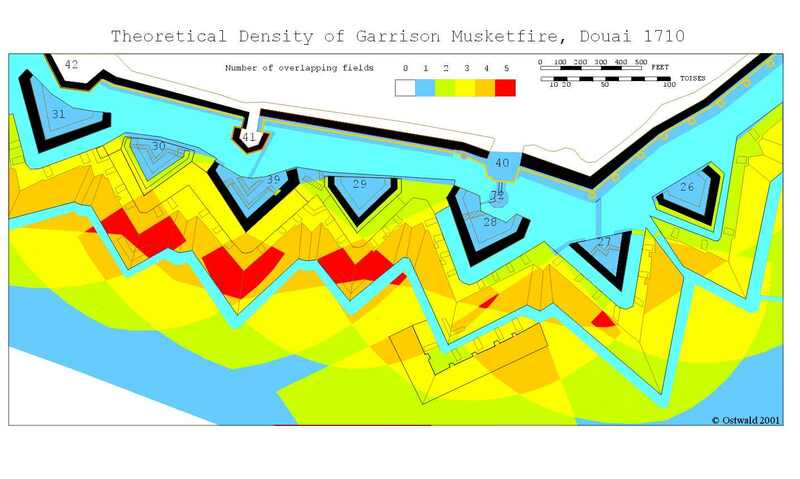 “The Spatiotemporal Model of an 18th-Century City Siege.” Social Science Computer Review, November 17, 2014, 0894439314558559. doi:10.1177/0894439314558559. The importance of terrain in warfare has often encouraged an intense relation between military conflicts and the use of techniques designed to understand space. This is especially relevant since the modern era, where the engineers who built and assaulted city defenses recorded the events with diverse documentation, including reports, diagrams, and maps. A large number of these sources contain spatial and temporal information, but it is difficult to integrate them into a common research framework due to its heterogeneity. In this context, geographical information science provides the necessary tools to explore an interdisciplinary analysis of these military actions. This article proposes a new approach to the study of sieges using a spatiotemporal formal model capable of integrating cartography, archaeological, and textual primary sources and terrain information. Its main aim is to show how concrete research questions and hypotheses can be explored using a formal model of this type of historical events. The methodology is applied to a particular case study: the French–Spanish siege of Barcelona that occurred in 1714. The protagonists faithfully recorded the development of the action, providing essential information for the model. Besides, different authors depicted the event as the paradigm of a city siege. For this reason, the model is also used to explore why real actions deviated from theoretical guidelines, clearly defined in different manuals. 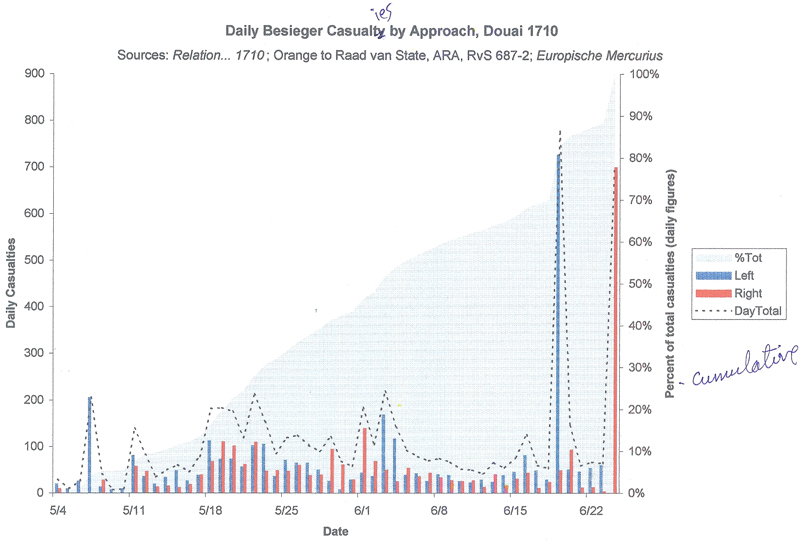 We use this scenario to explore two issues: (a) why the attackers chose to assault a particular city sector and (b) the factors that explain the casualties of the besiegers. 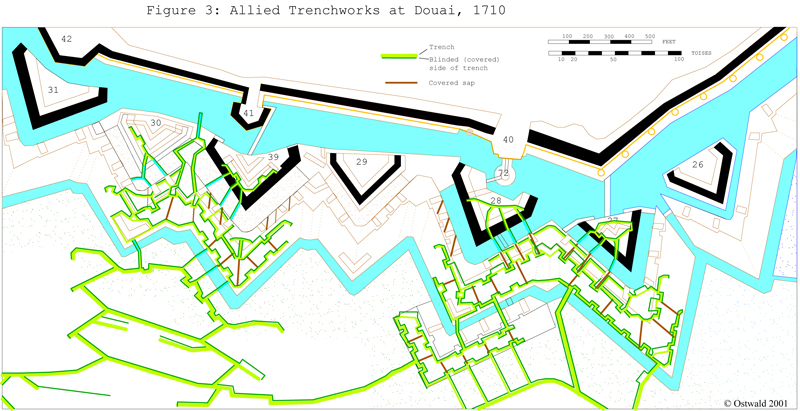 We conclude that we need methodological tools capable of integrating heterogeneous information to improve the understanding of siege warfare that affected not only military conflict but also the shape of European urban landscapes. That article includes some interesting discussion and insightful maps of the attacks, siege casualties, etc. Now if only somebody did it for every siege! I’ve got dibs on Douai 1710, if I ever take the time to play around with GIS. I also have the number of daily workers, so a casualty rate over the length of the siege could easily be calculated. Now I remember why it took me so long to finish my dissertation – because I wrote 1.5 of them instead of just one.